In the spring of 1944, Max Eisen and his family were rounded up from their home in a Hungarian-controlled region of the former Czechoslovakia, and deported to Auschwitz. This was the final step after five slow years of increasing hate towards Jews, and restriction of their rights and freedoms. Max’s entire family would perish in the camps, lost to the gas chambers, and to medical experimentation. But a lucky chance, resulting in a position as an assistant at the prisoner’s infirmary, would allow Max to survive, and bear witness, fulfilling his final promise to his father by becoming a dedicated Holocaust educator, and now memoirist. 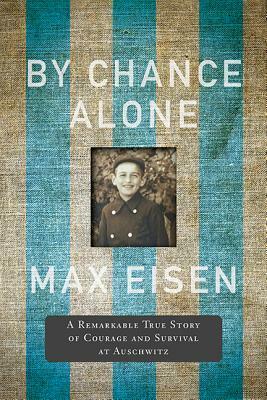 By Chance Alone recounts his childhood, time at Auschwitz, and his path to Canada. Max was fifteen when he entered the camps as slave labourer for the Nazis. As he would discover later, his mother and younger siblings, including his infant sister, were sent directly to the gas chambers. Revisiting these events more than seventy years later, he brings an unusual perspective, simultaneously capturing his youthful naïveté about what was going on around him, and the later knowledge he would gain about the depth and scope of the atrocities. For the most part, he remains in the moment, recalling the events as they occurred, though occasionally he provides information he would not have access to until later. For example, when his father and uncle were selected, he had no idea what their fate would be, only that he would never see them again. Decades later would he learn that they had been chosen to be subjects in the Nazi’s twisted medical experiments. While Mengele’s experiments are relatively well known, Max’s account takes the reader inside a different part of the medical establishment at Auschwitz, where imprisoned doctors cared for fellow prisoners with limited equipment and resources. Max worked under Polish dissident Dr. Tadeusz Orzeszko, who he believes to have been a member of the resistance, working to that end even while he was imprisoned. The additional comfort and resources Max was able to access as a medical assistant built up his strength, and were likely crucial to his survival of the death marches the Nazis took their Jewish prisoners on during the final days of the war. However, the end of the war did not mark the end of his ordeal as a refugee; a return to his home town did not yield a warm welcome. He recounts all of this in a straightforward prose style, bearing witness to what was done to his people, as he promised his father he would. By Chance Alone was defended on Canada Reads 2019 by science broadcaster Ziya Tong, who mounted a thorough and impassioned defence that emphasized the importance of Holocaust education in inoculating Canadians against hatred of all types. Tong cited a study that found one in five young Canadians are not sure what the Holocaust was. She felt that it was urgently important to for Canadians to read a book that would take the Holocaust from distant, colourless historical event to a living, breathing person who experiences those events. Armed with a variety of statistics, as well as enthusiasm for her subject, she urged Canadians to read By Chance Alone and remain vigilant against the rise of hate crimes in our country, and around the world. By Chance Alone faced a few crucial moments throughout the week, including comparison of its writing to style to more lyrical works such as Brother. Tong made a persuasive case for Eisen’s narrative style, however, arguing that he was writing the voice of a child, but with the wisdom of a ninety-year-old. Other panelists praised Eisen’s attention to detail, and the hypnotic nature of his simple prose style. Tong also made a strong demonstration for the book’s contemporary relevance, bringing to the table a recent photo of Max outside a synagogue, which had been defaced with anti-Semitic graffiti only last year. On Day Two, panelist Lisa Ray raised the question of what By Chance Alone adds to the body of Holocaust literature that is not already there, contrasting Eisen’s style to that of Elie Wiesel. In her initial rebuttal, Tong pointed to the infirmary as an entirely unique contribution that provided information about the camp that even other internees did not necessarily have. The subject was raised again on Day Three, where panelist and free agent Joe Zee argued that each perspective on the Holocaust was unique and new, and that it is history told in a way that cannot be learned from a textbook. It came down to a close call that day, with Ray and Yanic Truesdale voting against By Chance Alone, while Tong, Zee, and Chuck Comeau voted against Brother. However, the book carried on to the finale. With one vote each from the remaining defenders on the last day, it was up to the free agents to determine the final result. Lisa Ray voted against By Chance Alone for the second day in a row. However, both Joe Zee and Yanic Truesdale voted against Homes. After much discussion on the final day of debates about the voice of the youth, and the wisdom of the elderly, both panelists were compelled by the argument that Holocaust voices are fading, and soon there will be no more living witnesses to tell their stories. Soon the books will be all we have left to ensure that we never forget. And so By Chance Alone became the winner of Canada Reads 2019.